Is your cruise ship docking in Naples or Sorrento? A great shore excursion for the day is the Island of Capri, which you can easily organize independently without having to book with your ship's group shore excursion. Here's how to organize your independent shore excursion to the Island of Capri, Italy. 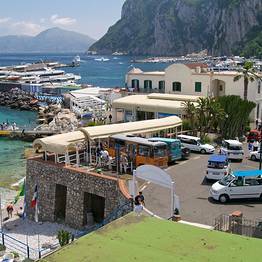 Cruise ships dock near the Molo Beverello pier, where high speed ferries to Capri depart. Routes run frequently and tickets can be purchased directly at the pier or online. Buy a round trip ticket so you won't have to worry about purchasing your return ticket later! The sea crossing from Naples to Capri takes about 50 minutes. Cruise ships dock off the port of Marina Piccola, with shuttles which take passengers ashore. Ferry routes run frequently in the morning; purchase a round trip ticket for the first high speed ferry available, or book online. Sea crossings from Sorrento to Capri take about 25 minutes. Sit on the left side of the ferry to enjoy the view. Pack your patience, because on days in which cruise ships dock at the port in Marina Grande, the island gets very crowded and lines for the funicular from the port to the Piazzetta are long. If you would like to visit the Blue Grotto, we suggest you head there as soon as you reach the island. If you are able to reach the port between 9 and 10 am, you'll find that there is not much of a line. You can choose between going directly to the Grotto, or combining a visit to the Grotto with a tour of the island by boat. Tickets to enter the Blue Grotto cost EUR 13 and are always purchased separately directly at the entrance to the Grotto. 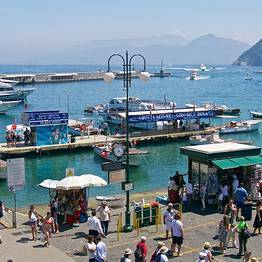 From the port, you can take the funicular uphill to the Piazzetta in Capri town in 4 minutes. If there is a long line, you can also take the bus from Molo 21 pier or from the bus stop near the pier. A particularly convenient and pleasant alternative is to take an open-top taxi: the fixed fare from the port to the Piazzetta is EUR 15. From the Piazzetta, walk down Via Vittorio Emanuele to the historic Quisisana hotel, and then follow the signs for the Gardens of Augustus. 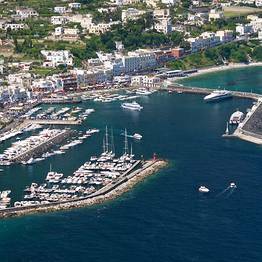 Entrance costs EUR 1 and from there you can enjoy a breathtaking view over the Faraglioni and Marina Piccola. On your way back, take Via Camerelle, lined with luxury boutiques, and continue along Via Tragara to the scenic overlook. Walk back along Via Fuorlovado and Via Le Botteghe until you are in the Piazzetta. 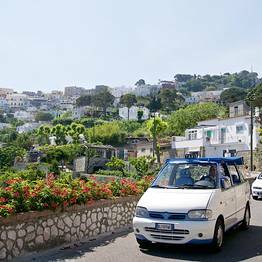 To visit the other two most famous tourist attractions on Capri, you'll need to go to Anacapri, the island's other town. From Capri town, it's about 10 minutes by bus or taxi. The chairlift leaves from Piazza Vittoria and takes you to the top of Mount Solaro in 12 minutes. Chairlift: roundtrip ticket: EUR 10; free for children under 8 who ride on their parents' lap. Villa San Michele: Entrance: EUR 7. There are often long lines to board the bus at the Piazza Vittoria stop. To avoid a long wait and be sure to get a seat on the next bus, walk along Viale Tommaso de Tommasi a few meters to the previous stop, where there are never many people waiting. Or if you are up for a strenuous downhill climb, from Villa San Michele you can climb directly down the Phoenician Steps to the port: 900 steps connecting Anacapri with Marina Grande, which were once the only link between Anacapri and the outside world.